Maybe you want to contribute something to Racket: You’d like to improve the documentation, or you’d like to add a small feature. Maybe you’re comfortable with Git, but haven’t made a pull request before. Maybe you’ve made a one-off pull request, but haven’t tried to contribute to the same project over time and stay in sync with the upstream project. If so, you may find my guide helpful. I was hopelessly confused about how to handle the branches and merging. After I figured it out, I wrote this down in a Gist as a note to my future self. Today I figured I’d dust it off and make it into a blog post. Fork plt/racket and git clone your fork to your computer. For more help on this, as well as building Racket locally, see Joe Gibbs Politz’s excellent blog post. Go read it now. I’ll wait. If you only update this way, it will ensure that your master branch is a simple, exact mirror of the plt/racket master branch. Your master won’t become cluttered with extraneous merge commits (like “Merge branch ‘master’ of github.com:plt/racket”). This makes it easy to create pull requests containing only the commit that you intend. Important: The --ff-only flag is the key to this. Don’t use git pull without this flag. Note: git pull --ff-only upstream master is a shortcut for two steps, git fetch upstream and git merge --ff-only upstream/master. Make your changes and commit. Don’t forget tests and documentation. Maybe you like to commit often as you work on a feature. I do. It’s a form of backup and a paper trail. That’s great, but preferably your pull request should be just one commit. Easier on the maintainer. Plus the upstream project doesn’t need 20 commits in its history for your 1 feature. You should rebase your topic branch on the upstream master, to catch any changes or conflicts. You can do both with git rebase. #    multiple commits into one. # 2. If any conflicts from upstream, resolve them. See squashing commits with rebase. The point of the -f (force flag) is in case you had already pushed this topic branch. After you use rebase (above), you’ll probably need to force the push. Note: Using push -f is usually bad. Here it’s OK because we’re push -f-ing to a topic branch in our forked repo that no one has pulled from yet. Visit your forked repo’s page on GitHub. You can also use the main Pull Request button. Commits. Preferably this should have the number 1 next to it — just one commit in your pull request. You should click the tab and double-check that the commit is what you expect. Files Changed. Again, double-check to make sure it looks correct. 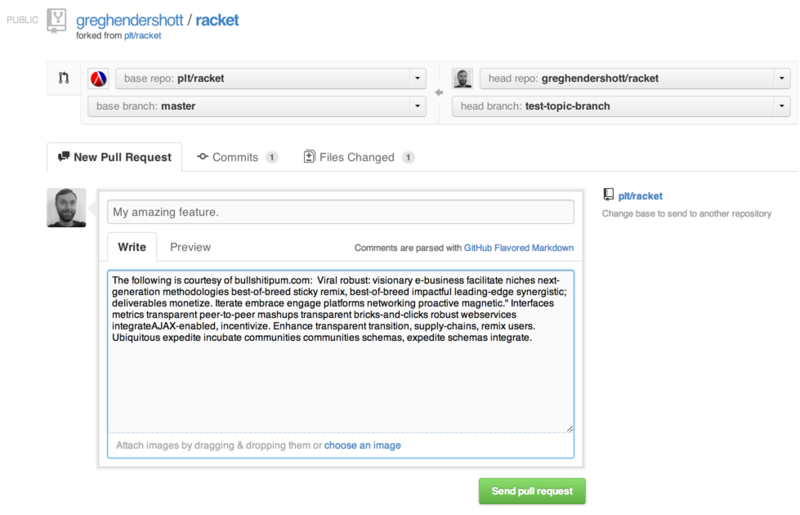 When all looks good, click Send Pull Request. What next? You wait for your pull request to be accepted and merged. Then it will flow back to you when you do git pull --ff-only upstream master, because your commit is now part of the official plt/racket repo. But it might take awhile for the pull request to be accepted. It might never be accepted. In the meantime, you might be tempted to merge your topic branch into your own master. Don’t! If you were to do that, your master would cease being a nice clean mirror of the upstream master. Remember how no one likes a dirty fork, so we’re diligently using git pull --ff-only upstream master? So the simplest thing to do is just wait. But if you really want to use your feature, in your own custom build, I suggest making some other branch (e.g. custom-build). Feel free to merge from your topic branches (and from upstream master) into that branch, from which you can build your custom variation of Racket. Just remember that topic branches for pull requests should still always be based off your master, which should be a fast-forward mirror of upstream.